Each year the very best Pokémon video and trading card game players meet at the World Championships to determine who the top trainers are, and each year the Masters (oldest) Division looks really awkward on stage. This year did not disappoint. I am so used to working on the weekends that I completely missed this year’s competition, which is a pity, because the only thing I love more than watching young, kind children compete against each other good-naturedly is watching the older competitors try to keep their language in check for the family-friendly crowd. Thankfully The Pokémon Company put together a tasteful recap video of the San Francisco event, reminding us of why people go to these things in the first place. This may come as a surprise to you folks, but Japan and the United States dominated this year, with three World Champions each. 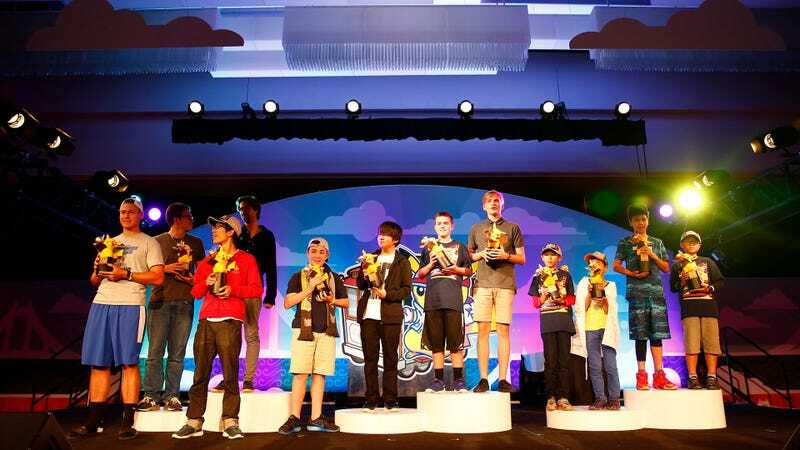 The U.S. swept the video game portion of the program, each first place winner taking home $10,000. Japan took two of the Trading Card Game spots, Juniors and Masters, while Denmark snuck in to grab the Senior division, with grand prizes of $25,000 each (you can check out prize breakdowns here). I want one, but I am not the very best. Japan also took the Masters division of the inaugural Pokken Tournament competition, while the UK represented for the younger division. Wolfe Glick, 2016 Pokémon Video Game Masters World Champion.